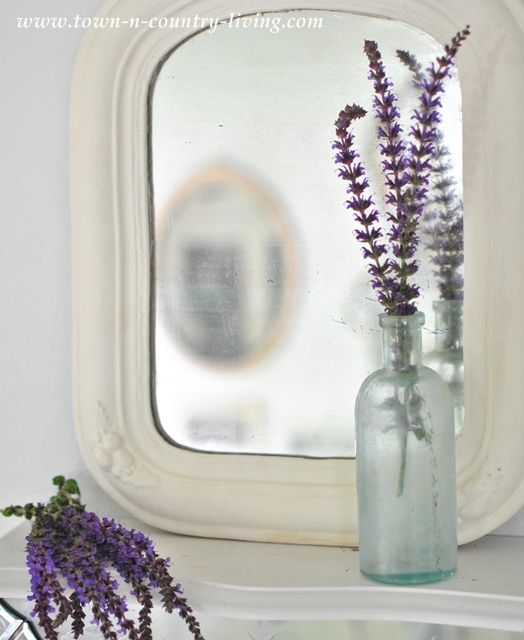 What is it about vintage mirrors that cast their spell and draw you into their aged beauty? Something about their blemished, cloudy glass creates an ethereal and ageless appeal. 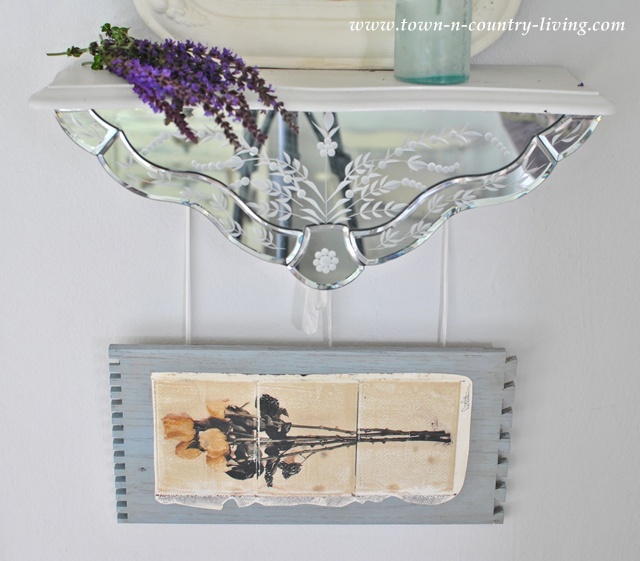 I’ve been collecting old mirrors for a while now and recently created this little vintage mirror vignette from various flea market and junk finds. 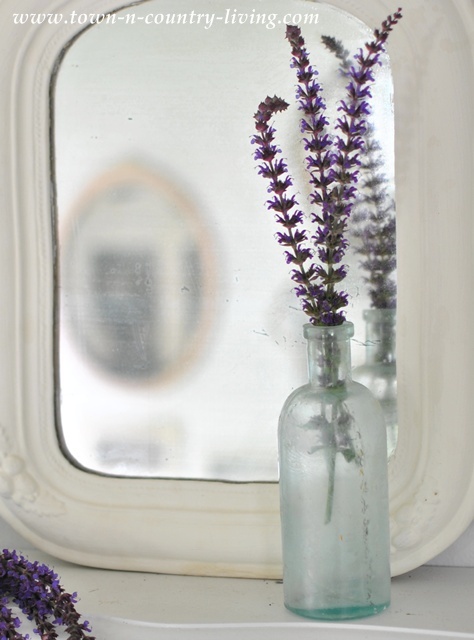 Sage flowers from the yard join an aqua bottle and vintage mirror on a shelf. 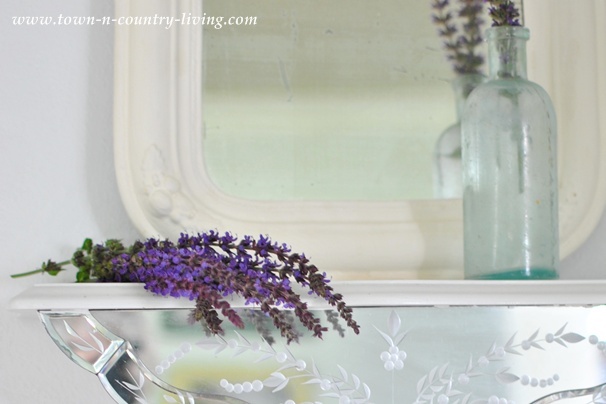 The small arched mirror was discovered at the Kane County Flea Market for just $10. Although it’s small, it’s a thick, heavy mirror of good quality. I found the shelf at the same flea market and love the clever way the vendor had attached an etched mirror at the bottom of the shelf. For $20, I couldn’t pass up its graceful curves and detailed etching. The purple sage from the garden is no longer in bloom. Each year it comes back stronger and makes a great cut flower. The aqua bottle in this vintage mirror vignette is from a local dump. I’ve found several vintage bottles there. Hanging from the shelf is a DIY floral artwork. The wood is actually the side of a drawer painted with Annie Sloan Chalk Paint. I used a mix of Paris Grey and Louis Blue, then slightly distressed it. 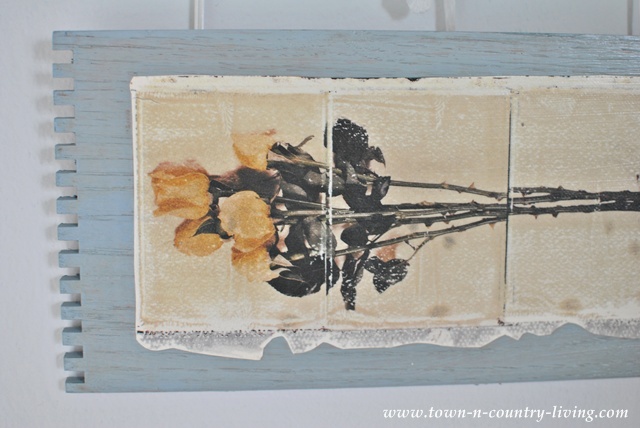 The rose print is also from the flea market and was purchased for one dollar; I simply cut it to size and decoupaged it onto the wood. I then used seam binding to tie it up with a small bow onto the shelf. My vintage mirror vignette cost a mere $31. I can swap out the decor on the shelf relevant to the the season. I’ll soon be placing some candles here for the autumn season, to keep it cozy in the dining room. What a stunning shelf Jennifer. A bargain buy for sure and so unique. I’m pleased to be back in blogland again and catching up with all my friends. I feel like I’ve missed so much. Heading off now to scroll through your recent posts. 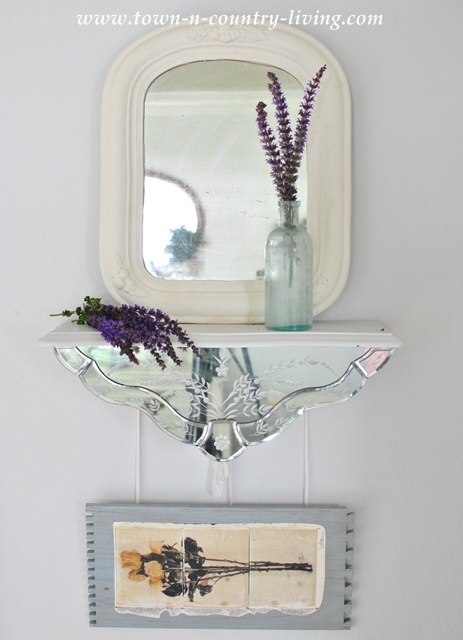 I’m a lover of vintage mirrors as well! There’s just something about them… Your vignette is so pretty with your lovely finds. 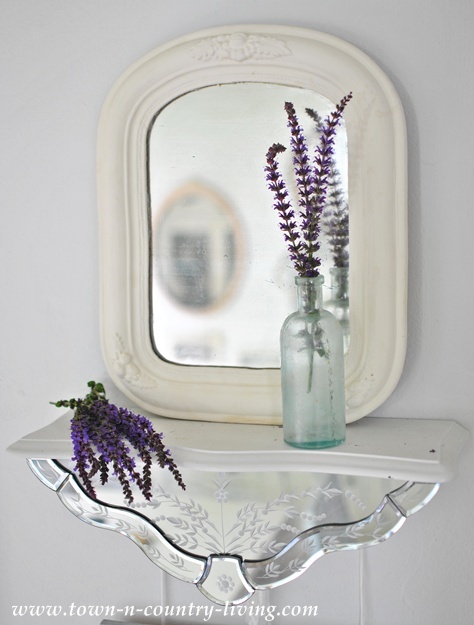 Love your mirrors and you have really created a beautiful vignette. The etched one is just beautiful. $31.00 well spent. Beautiful vignette Jennifer! 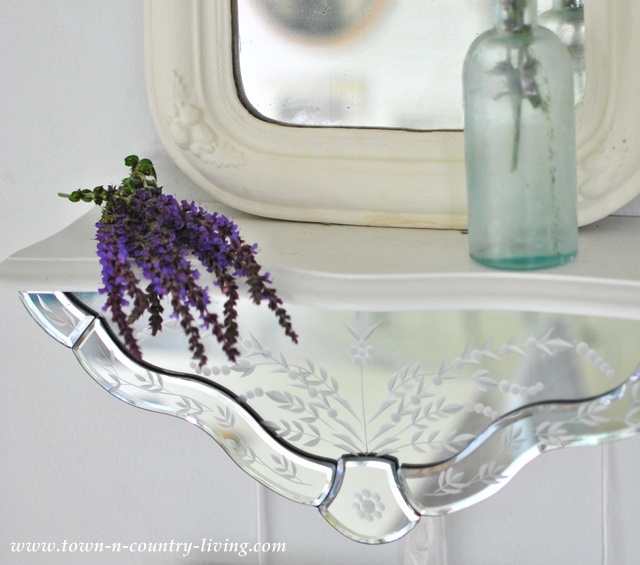 Love that etched mirror! Wish I lived near that dump!LOVE that bottle! Sweet sweet sweet, Jennifer! I love the way you put all of these beautiful pieces together to make a fabulous statement piece! Love it!!!! What a GORGEOUS vignette!!! Love it! !